Popping in today to share another page made with Fancy Free! DESCRIPTION: I love those patterned tearaway strips on the bottoms of papers nowadays and try to use them on layouts instead of throwing them away. No scrap goes unused! Here I did a simple weaving technique to feature most of the tearaway strips in Fancy Free. JOURNALING SAYS: We try to go somewhere new as often as we can - have to take advantage of our time living in Germany! This is in Nabburg. 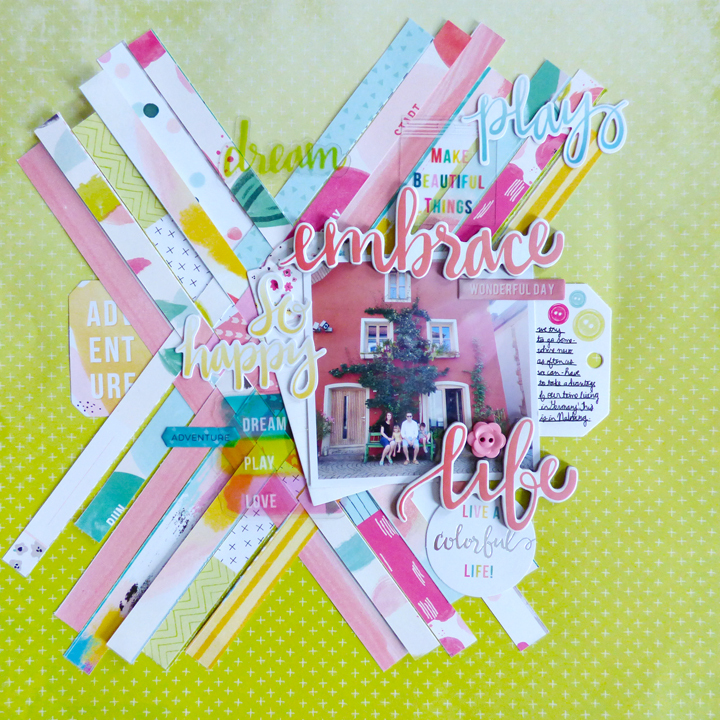 HOW TO: Trim off the tearaway strips from the bottoms of the papers in Fancy Free and weave them together on the left side of the neon green ombre paper. Use glue sparingly so the tabs can lift and create dimension. Place a photo on the right side then embellish with phrases of different types: chipboard, acetate, die cuts, puffy stickers, etc. Journal on a tag and tuck it under the photo. Do you save and use the tearaway paper strips?! I love using those bottom strips too!! LOVING how you weaved these together!! GORGEOUS!!!!!!!!!!!!!!!!!! Yes, she is! And you are one lucky guy, Chris!